Part two of my long detour that resulted in lots of drone photography. 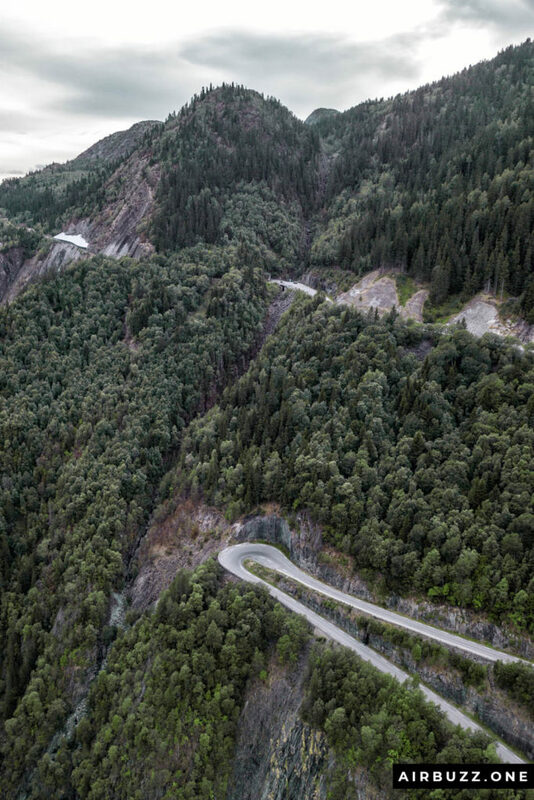 A while ago I wrote about a road trip that resulted in some ok shots of winding roads with hairpin curves, the type that looks great on drone photography. 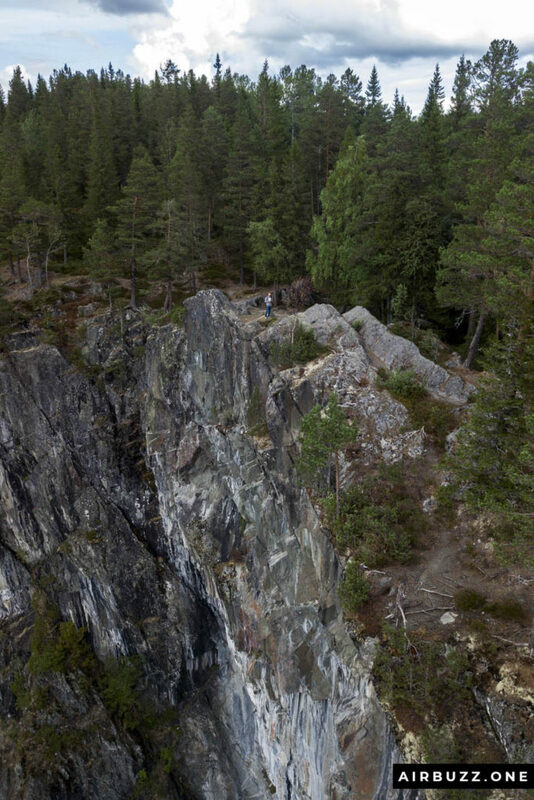 I published some pictures of the roads and from a bridge, I thought looked cool with a rocky riverbed below. 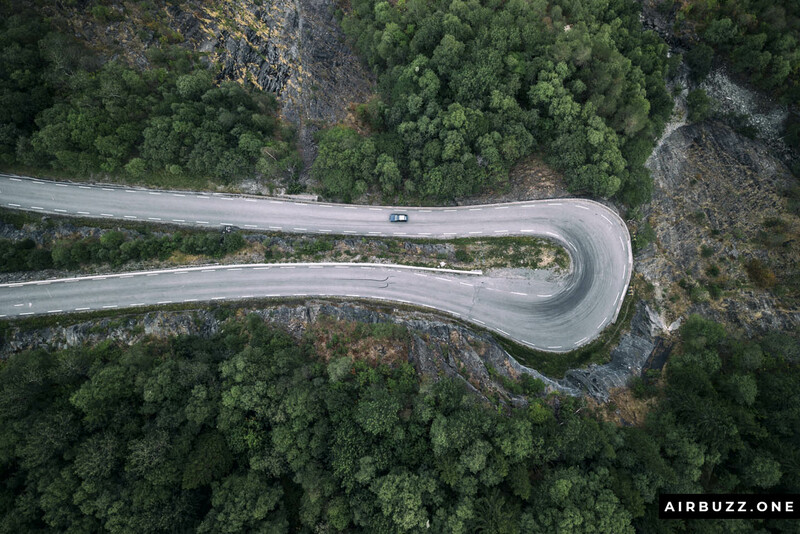 That article was called ‘Drone photography of winding roads and a bridge!‘ with the subtitle ‘A long detour home resulted in some cool drone photos of winding roads!‘ Read it here if you haven’t read it already. 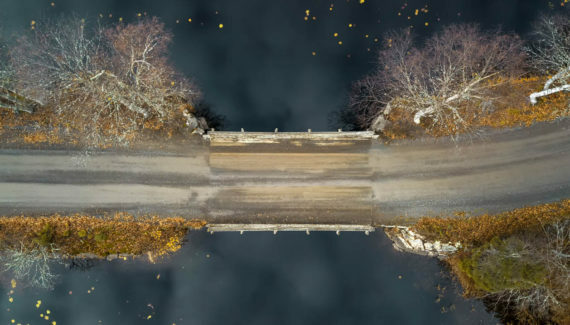 Previous article: 40 Examples of VERY Creative Drone Photography! I stopped at a few other locations along the road on my way home. I found a mindbogglingly tall cliff, a famous waterfall, and an even more famous powerplant. Read more below while you look at the pictures. First I saw a road sign to a place called Ravnejuv. I decided to check it out. The name is translated to something like Ravencliff in English. For a long time, I followed a smaller road into the forest and up on a hill, didn’t really know what to expect. I parked my car an went for a walk along a narrow path. Suddenly a big sign appeared on a tree right in front of me saying in three languages: WARNING 100m to the cliff edge. Hight ca. 350m’. Sounds promising. 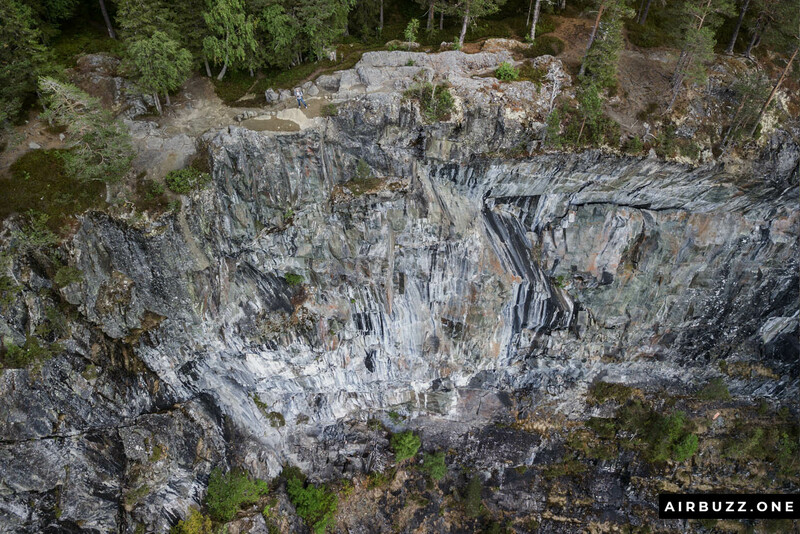 I have later read the height is closer to 370 m.
It is difficult to feel the same feeling I had when I stepped onto the edge of the cliff from the images below. 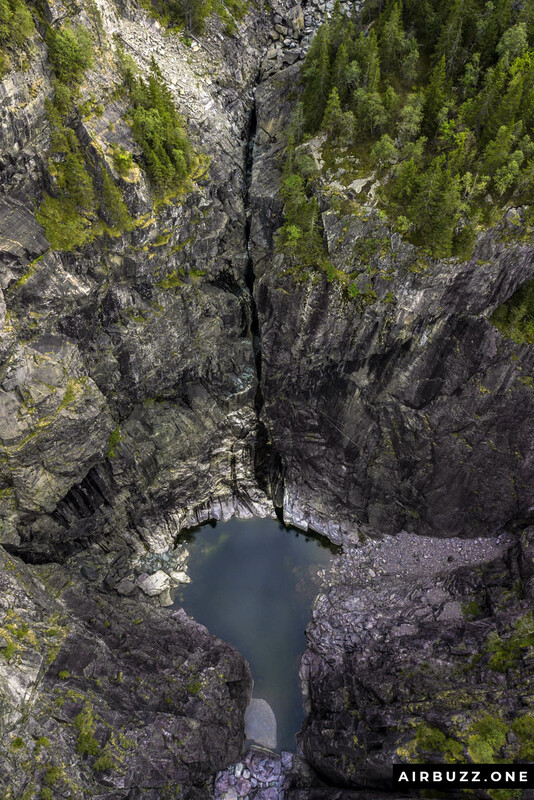 2D images don’t justice the awesome vertical drop. This place is a very old tourist attraction. During the late 1800’s people from came from abroad to visit the cliff and dare to look down. The most prominent guests came in 1878. It was the Swedish Crown Prince Gustav and the French Emperor Prince Napoleon IV, who was on tour in Telemark. The following year, in 1879, King Oscar II also checked it out. The top of the cliff is actually leaning out which creates a strange wind effect when light things are thrown from the top – they tend to return. 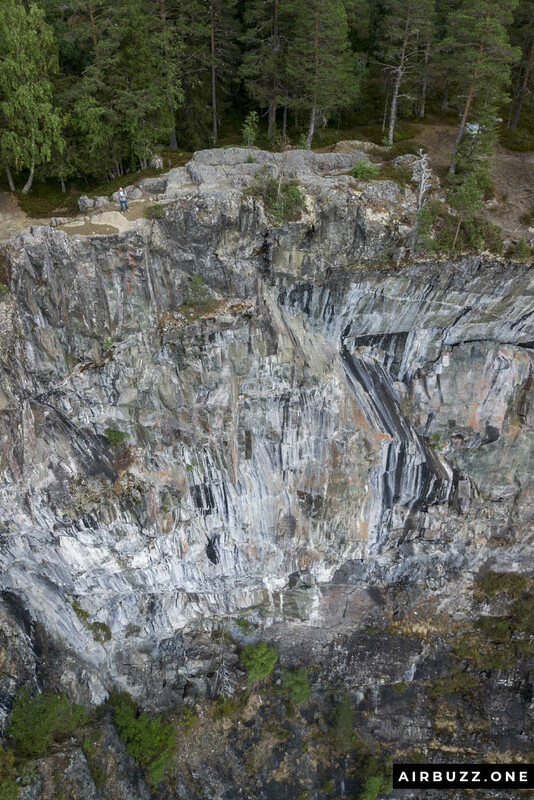 Sounds like a stupid place to launch a drone… In addition, it was extremely windy. But I did and took these photos before I packed up and left this awesome place, quite happy that I actually stopped. Click the pictures to see larger versions. 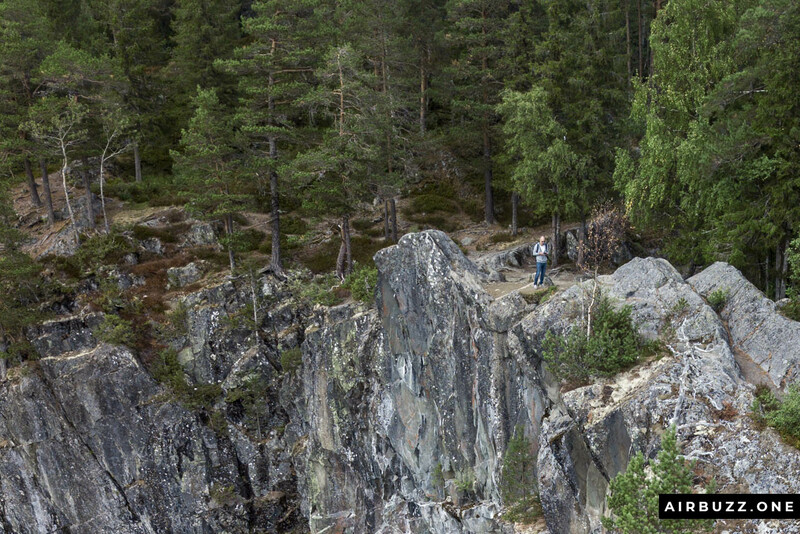 Launching a drone on the edge of Ravnejuvet. 370 meters straight down and high wind velocity. It is difficult to really feel the height in an image like this. People have visited this tourist attraction for centuries. 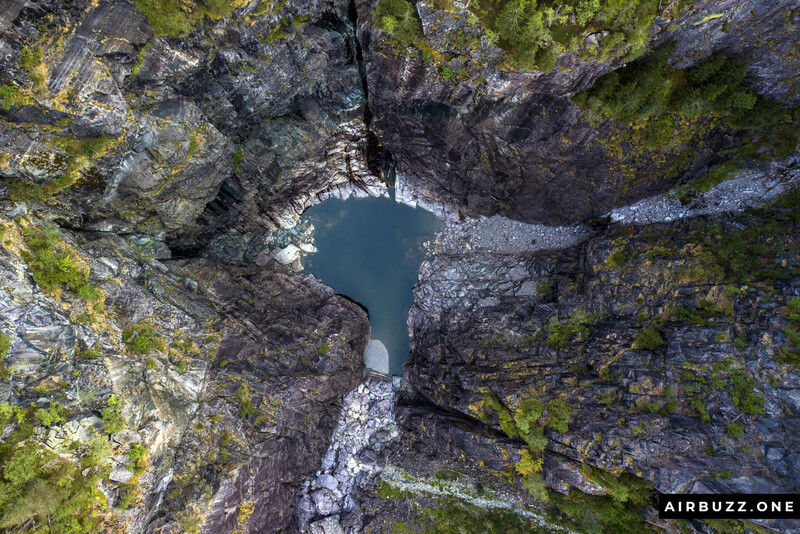 Straight down drone shot from Ravnejuv. Can you find me? 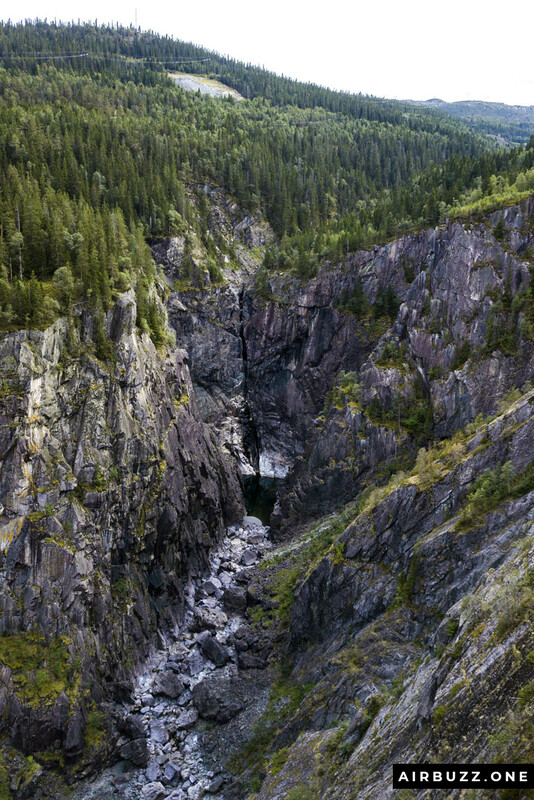 Next stop, closing into the city of Rjukan, I stopped to take a look at the famous Rjukanfossen – The Rjukan Waterfall. 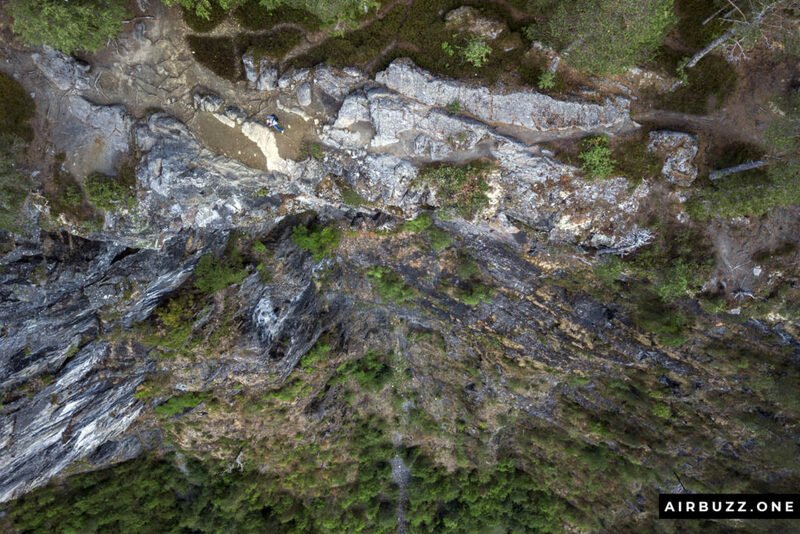 It was once looked at as the “world highest waterfall”, but this was a bit exaggerated. 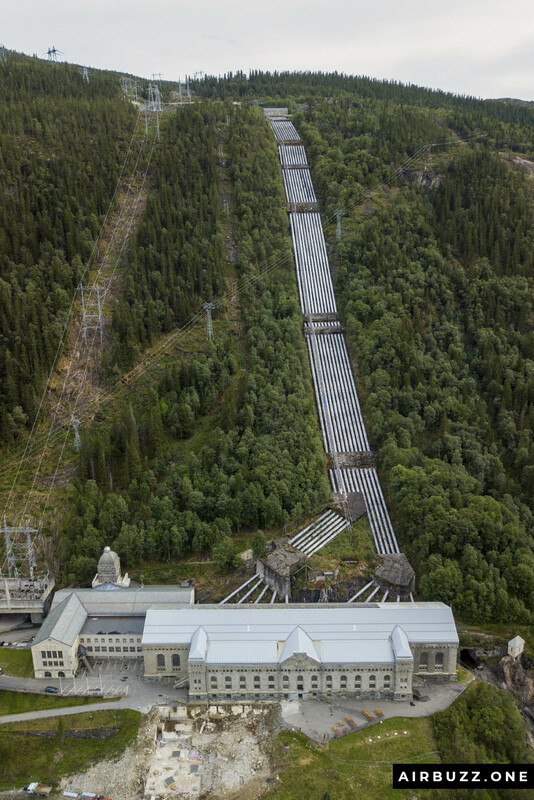 It was a bit disappointing that it was completely dry, but the explanation is that most of the water is led through pipes to the power plant below. In addition, the summer was extremely hot this year and lakes and rivers dried out. Once in a while, the waterfall is released in its natural beauty. That would be an incredible sight. Anyway, I flew my DJI Mavic Pro drone over to take a look. So check out the images below. The dry waterfall in the distance. 105 m tall. A small pond in the bottom of the waterfall. It would have been cooler to see it with water. Very little water this year. The viewpoint where I launched the drone. 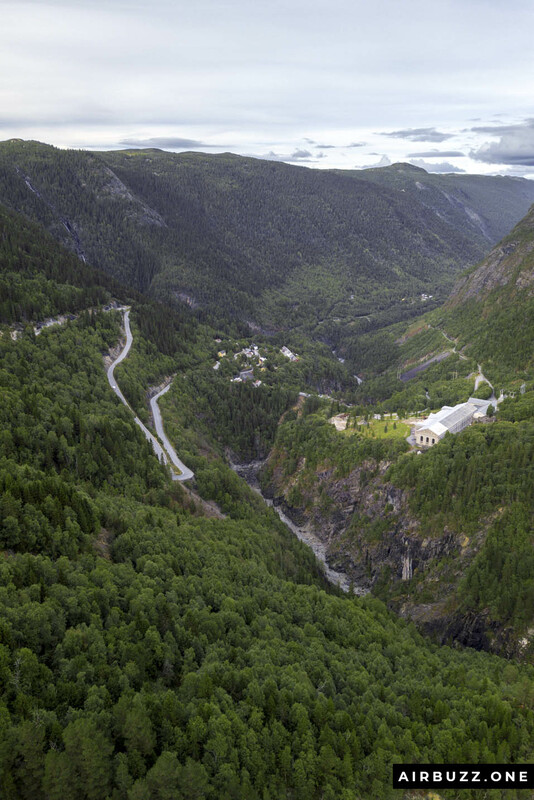 Winding roads and the famous Vemork power plant in the distance. 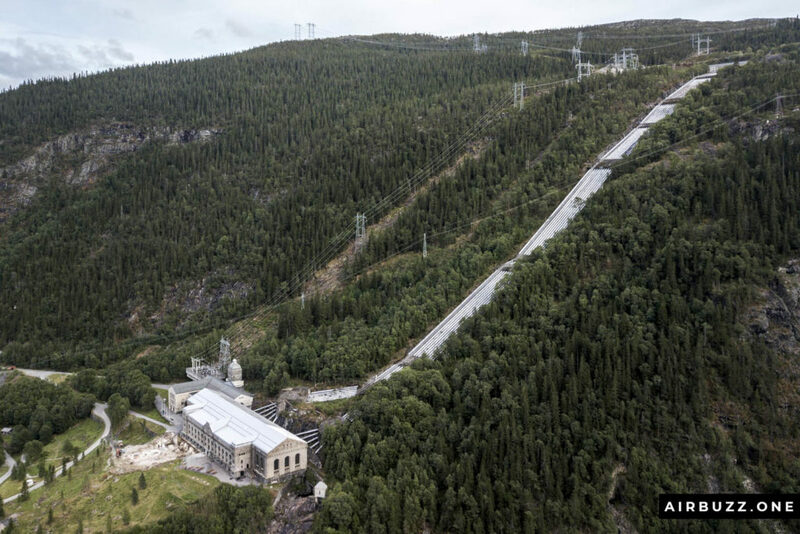 Last but not least, the awesome hydroelectric power plant outside Rjukan, Vemork Powerplant. 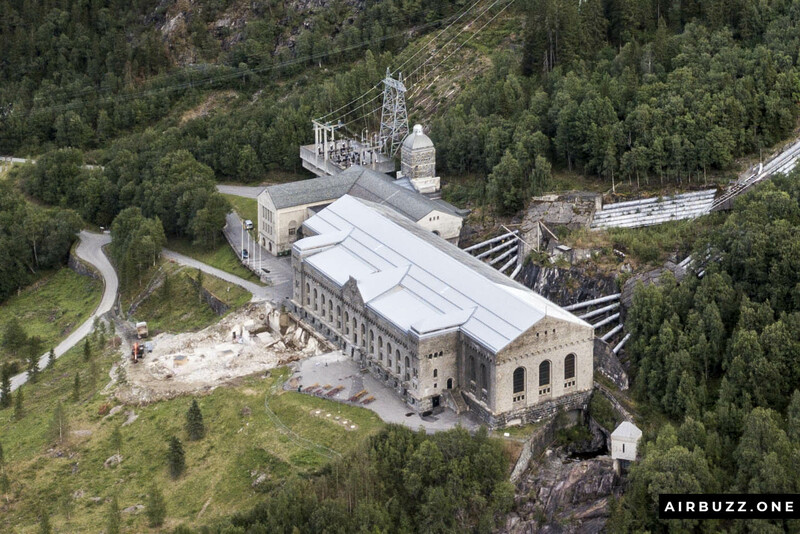 When it opened in 1911 it was the world’s largest power plant with a capacity of 108 MW. It is a beautiful piece of architecture with the characteristics pipes going down to the turbines with water from high up the mountain. 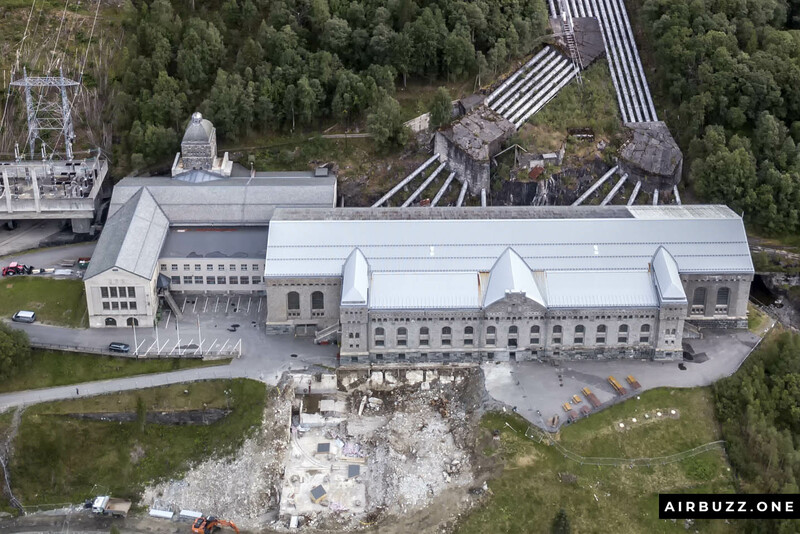 During the second world war, it was the scene of the Norwegian heavy water sabotage mission that prevented the Germans to get hold of heavy water for their Nuclear weapons program. 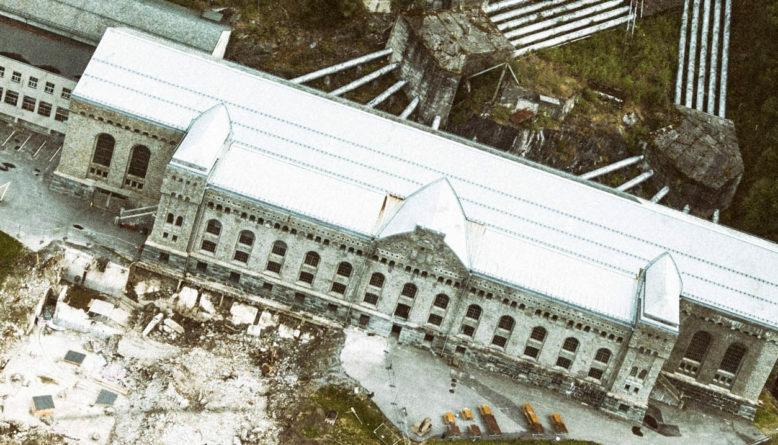 Now it is a museum accessible from passing a narrow bridge across the gorge. Hope you enjoyed this article and pictures. Once the world’s largest hydroelectric power plant. Now a museum. Flying the drone back to start. 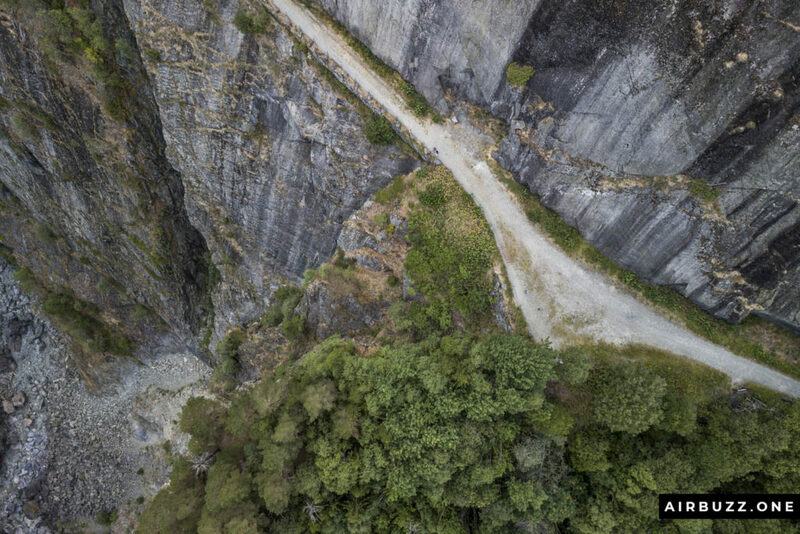 Hey, I managed to take another cool hairpin drone shot! 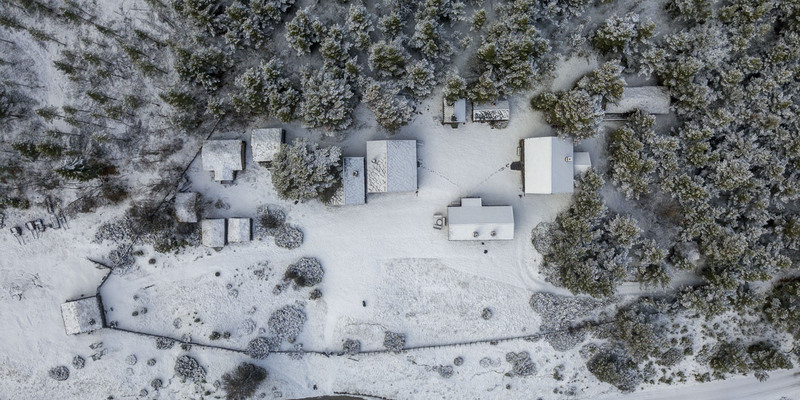 The Transition from Autumn to Winter documented with Drone! Awesome pictures and videos!!! Great job and a very cool hobby. The biggest waterfall in the world is Angel Falls is here in my country Venezuela. You should try someday! By the way, how high your best drone can go? and how far from the control remote can reach as well? Hi! Thanks for the commen! Glad you enjoyed the pictures. Would love to fly near Angel Falls! Looks awesome on pictures. 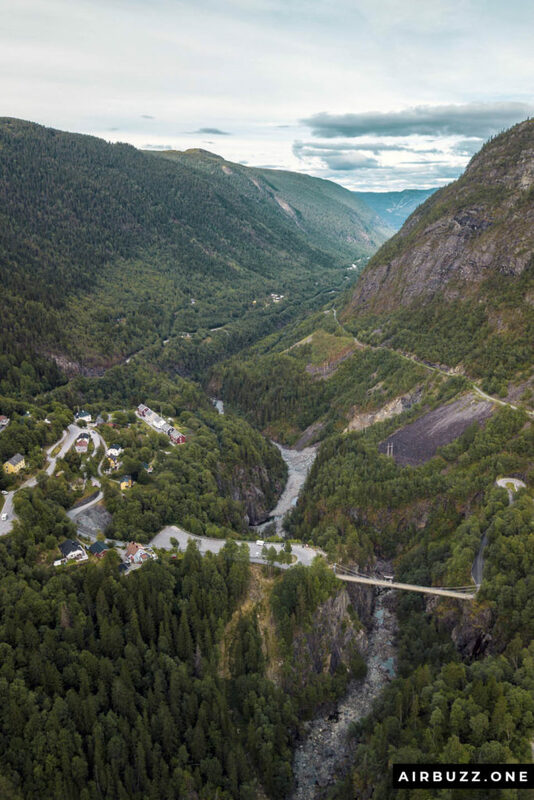 The drone can go pretty high, but the drone rules in Norway and many other countries are 120m (393 feet) from ground, so I don’t go higher than that. The manufacturer of the drone, DJI, says it can go almost 7 km from the remote control with video tranmission, but I have never tried to reach such distances. There are also rules that says I have to be able to see the drone at all times, and it gets pretty small very fast if I go far. Wow, those are amazing photographs! I like how you included some of the history with each location. Thank you, it was a good read. Too bad the water levels weren’t enough for the waterfall at that time though. Would have made an even more beautiful shot. 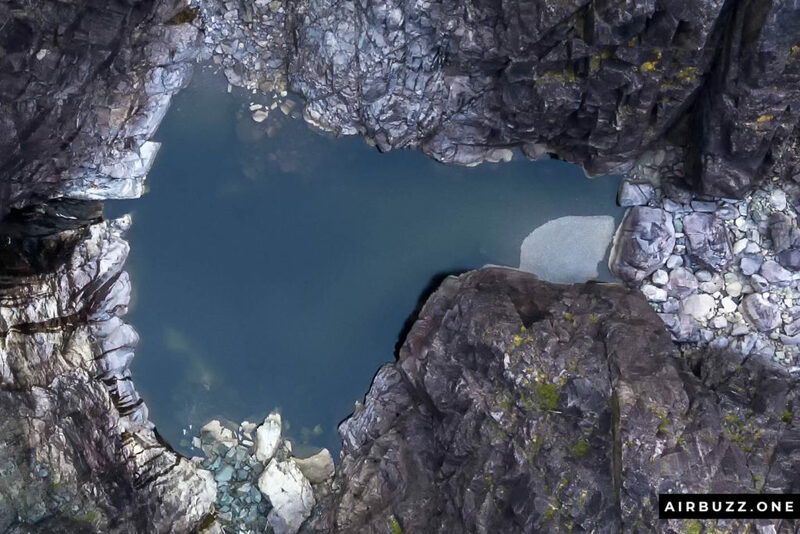 My favourite photo from this post is the first one you have of the small pond at the bottom of the waterfall. Sorry if I missed this somewhere in the article, but what country were you in for these pictures? Also, what’s your favourite thing to shoot? 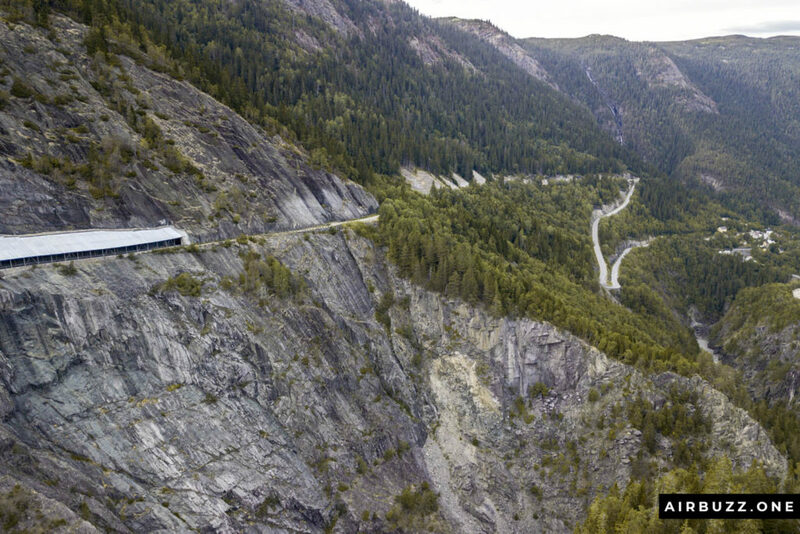 Like waterfalls, or mountains, or hairpin curves, haha.